Bright.Bazaar: Stripe Addiction Take Two! Stripes. I'm continually in the mood for them. Whether it be wearing them, decorating with them or photographing them. There's something intoxicating about their graphic simplicity and preppy feel. So, as my love for them reached fever pitch again last night (I indulged in a post on them here once before) I couldn't help but dive in and pull together a round of stripe inspiration! This time I've included spaces from some stylish blogging friends, including Nina's monochrome office, Annette's classic Italian apartment (where I was lucky enough to stay this past summer and trust me, it's divine!) and Bri's colourful L.A. loft. Plus there's some gorgeous ceramics and Unison bedding that I'm majorly lusting after. All in all a lovely dose of Friday inspiration! 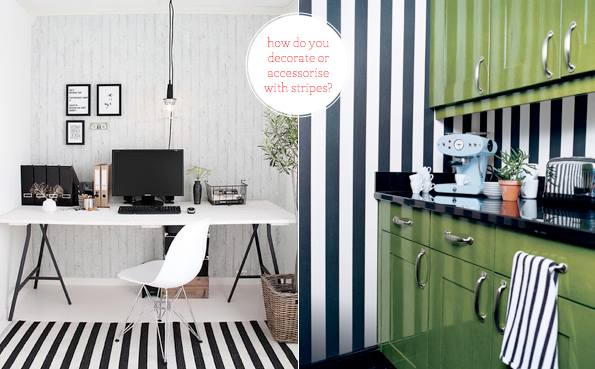 Do you decorate or accessorise with stripes at home? A black and white stripe always does it for me! yess!! stripes are my favorite - I find myself crazy attracted to anything with a bold stripe. especially blue and white, I love the nautical feel. that navy pinstripe is giving me ideas!! love it with the hit of yellow! UGH!!! Loooooooove stripes!!! Loving the black and white awnings. And I love wearing stripes, too. I love black and white stripes! The hotel I stayed in in Barcelona was decorated with black and white stripes and I've loved them ever since! I'm also obsessed with stripes! 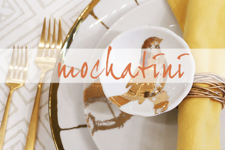 Although I prefer to wear them than decorate with them, this post has me thinking otherwise! I love that photo with the black and white awnings. And the cups are so cute. I adore the floor length monochrome stripe curtains, almost as much as the fabulous looking mood board in that photograph - total design envy! Stripes are the thing that will always be in style! I used them on my dining room chairs and painted them in my hallway. I love that they can go with any other print as well. Great board Will! 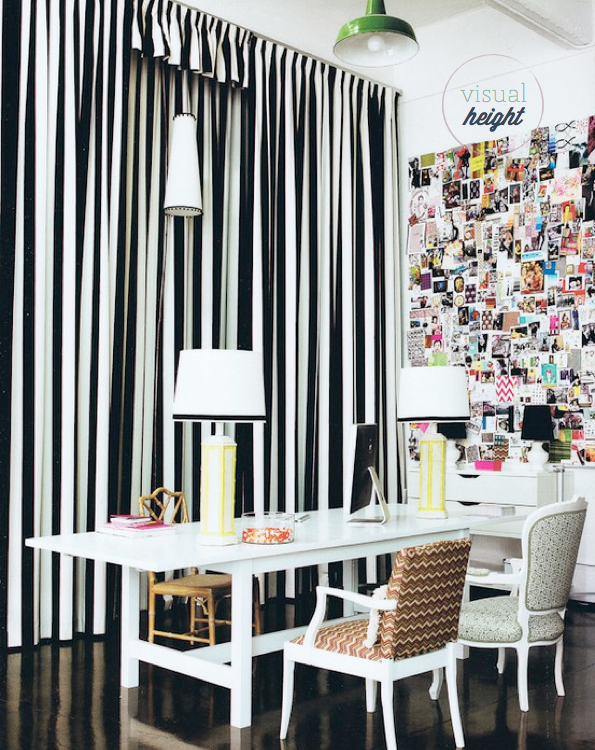 loving the b/w awnings and the visual height striped curtain behind the desk. I can never tire of stripes..happy first weekend of 2012 Will. I love the first images. 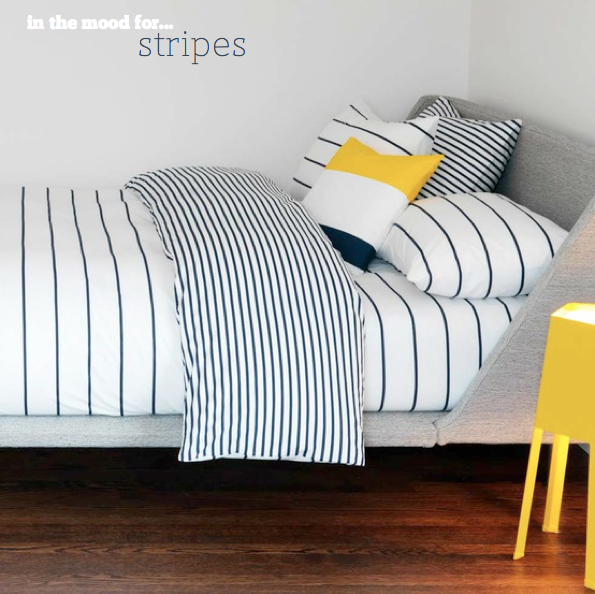 Two black and white stripe widths and that lovely bright yellow! Gorgeous. I love using stripes to visually heighten or widen a space! 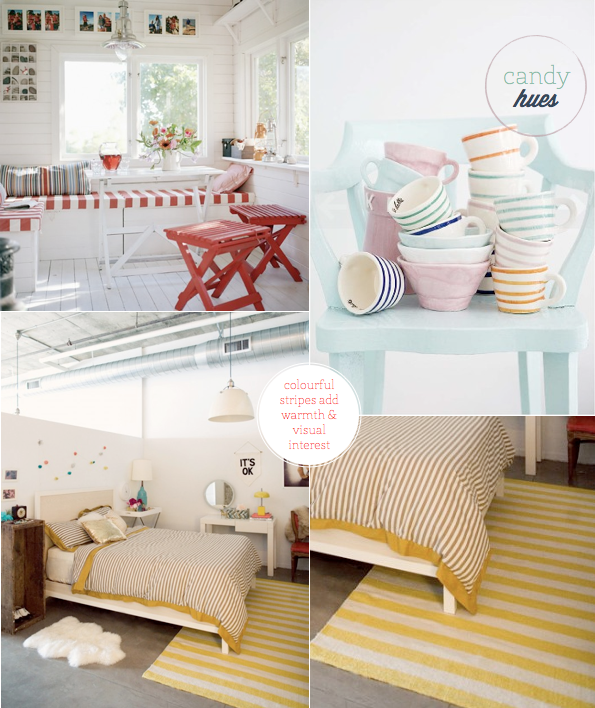 I have always loved stripes...just pinned several photos of that fantastic apartment. I love those awnings too! 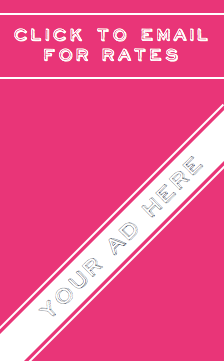 Love your collage style of photos..I use photobucket for mine, but it does not allow me to be this creative. You are right...stripes are striking yet classic! Love that! Wow! Stripes can be so classy and impressive... yes, I'm clearly a huge fan of them! That office with those long striped drapes is amazing. Loved it so much I pinned it to my pinterest board. Cutie candy coloured cups too. Stripes! I love them in black and white and in colors! They don't get old, only better!